18 | March | 2011 | Good News Everyday! CHICAGO – She scoured the streets day and night, venturing into strange and sometimes dicey neighborhoods. She wore a hat, sturdy shoes and a camera, always a camera, around her neck and at the ready. A woman in a white fur stole and evening dress drifting in the darkness toward a ’56 two-tone Chevy. 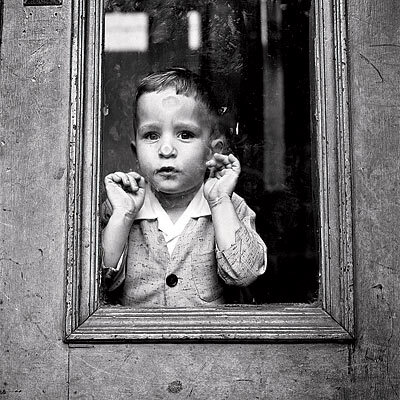 A curious little boy, undaunted by his size, using an empty window frame as a ladder so he can peek into a giant box. 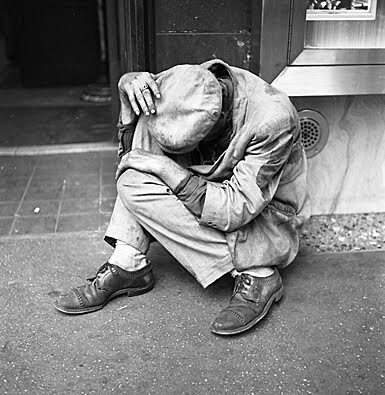 A huddled coil of a man defeated by life, his clothes soiled and tattered, his head hanging in despair. 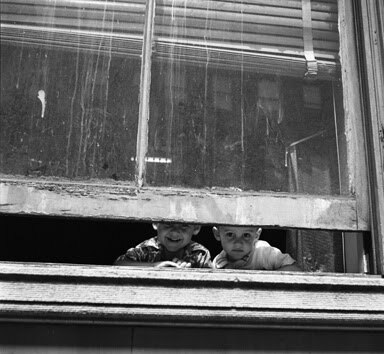 Fractions of seconds, captured by Vivian Maier a half century ago or more — fleeting moments of life on the streets at a time when men wore fedoras and dragged on Lucky Strikes, when women favored babushkas, when families piled in Studebakers and DeSotos for Sunday drives. Maier observed it all without judgment. This was her hobby, not her job. But over the decades, it also was her life. She shot tens of thousands of photos. Most were never printed. Many weren’t even developed. And few were seen by anyone but her. 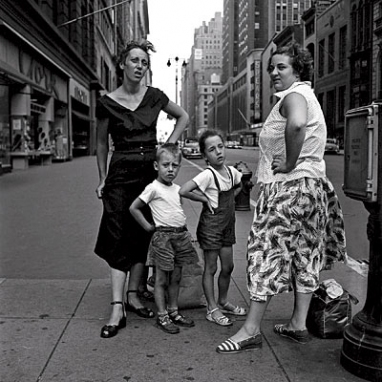 Vivian Maier wanted it that way. She guarded her privacy so zealously that she didn’t even want people to know her full name. She and her photos seemed destined for obscurity until a young man with an eye for bargains stopped by an auction house one day. He paid about $400 for a huge grocery box stuffed with tens of thousands of negatives. He knew only that they came from a repossessed storage locker that had been rented by an elderly woman. He carted the negatives home, not expecting much — maybe just some illustrations for a history book he was co-authoring about his Northwest Side neighborhood. He didn’t find any. But he did unearth a far bigger treasure. 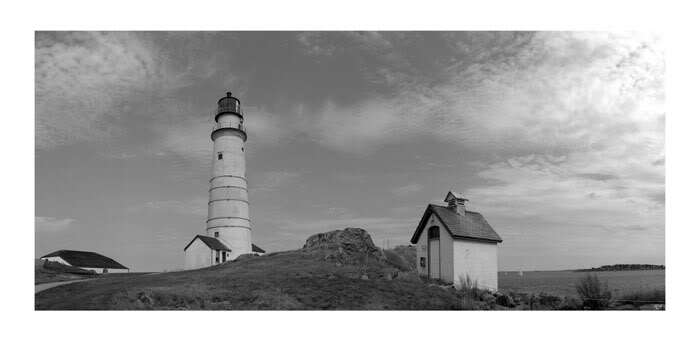 John Maloof had stumbled upon an undiscovered artist whose photography is now being compared to the giants, a reclusive woman who, in death, is attracting the kind of attention and acclaim she would have shunned in life. Striking scenes of every crane and every beam as Chicago’s John Hancock building went up. Captivating cityscapes of the elevated tracks in New York. Maloof was inspired to shoot his own photos. He even bought an old Rolleiflex — the sort of camera that had produced the photos — for $20 at an estate sale. 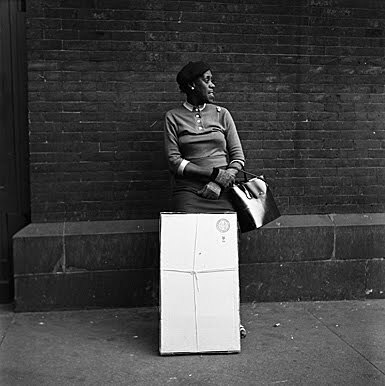 He knew nothing about Maier, but he wanted to meet her to talk about photography. But someone at the auction house said she was ill. And he didn’t press. Instead, Maloof decided to collect as much of her work as he could find. He contacted folks who’d bought Maier’s other possessions at the auction that day in late 2007. Soon, he owned 1,000 rolls of her film. But the cost of developing them would be high. So Maloof — who sells antique reproduction hardware online — peddled about 100 negatives on eBay to raise cash. Some went for $5. Others for $12. One for $80. One buyer happened to be Allan Sekula, a prominent photographer, critic and teacher. He offered some advice: Stop selling the negatives. The work was good enough for an exhibition and shouldn’t be dispersed. 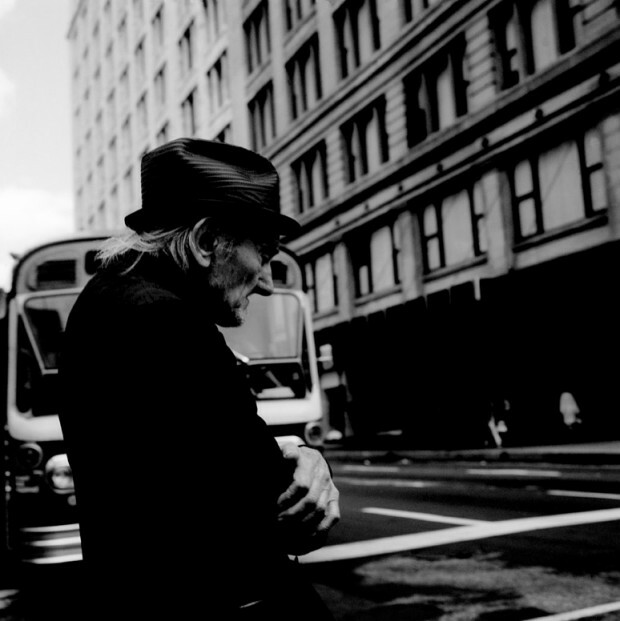 Maloof set out to learn more about Vivian Maier. His first Google searches had fizzled, but in April 2009, he spotted her name scrawled on the lab envelope of a roll of developed film. He tried again. This time, he found an obituary in the Chicago Tribune. “Oh, my God,” he said. Her 83 years on earth, summed up in 96 words. But one sentence stood out: “Second mother to John, Lane and Matthew.” Maloof wondered. Perhaps she was their stepmother? Maloof called the Tribune, but the newspaper’s leads turned out to be dead ends. The address led Maloof to two of the brothers who’d posted the obituary — Lane and Matt Gensburg. 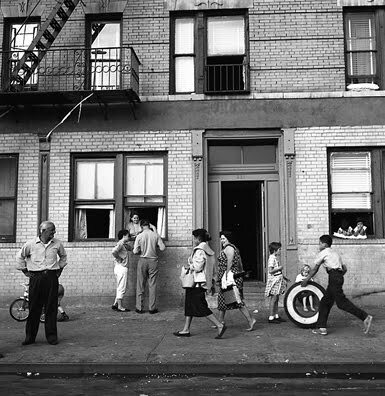 And so the mystery of Vivian Maier’s life began to unravel. 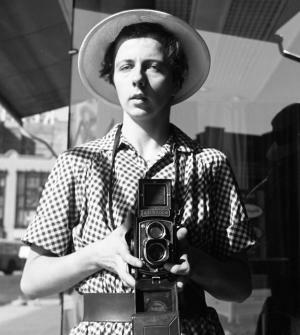 Vivian Maier, it turned out, had two distinct identities: A nanny for the Gensburgs and several other families in a 40-year career on the affluent North Shore. 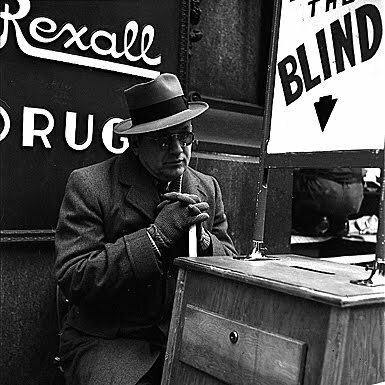 And before, during and after work, a photographer who chronicled the gritty drama and tender moments of street life in and around Chicago. Maloof, now 29, and his college-buddy-turned partner, Anthony Rydzon, tracked down families for whom Maier had worked, hired genealogists and chronicled her path from New York to France to the Chicago area. 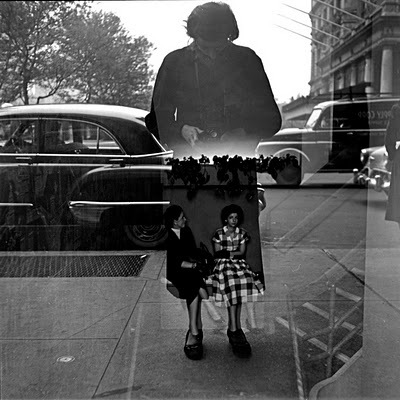 A picture of Vivian Maier slowly emerged: Fiercely independent. Eccentric. Opinionated. Private, yet confrontational. She was a Mary Poppins who would take her young charges strawberry picking and then make ice cream with them. A collector of everything from Marshall Field’s bags to railroad spikes to newspaper articles. A frugal shopper who told the homeless where to buy bruised fruit for a few cents. Her style was distinctive. So, too, was her look. Maier, a big-boned woman with a high-pitched French accent, covered her shortly cropped hair with hats. Her face was free of makeup (she did use Vaseline). Her clothes were matronly and usually second-hand. Her shoes were mannish. She had opinions about everything: Native Americans? They’d gotten a raw deal. Women? Just as capable as men. Marriage? No thanks. “I called her Mrs. once and she said, ‘It’s MISS Maier and I’m proud of it,'” recalls former talk show host Phil Donahue, who hired her as a housekeeper for his four teenage sons when he lived on the North Shore in the ’70s. He remembers Maier as self-reliant but not always kid-sensitive: She once served a fish with its head and eyes for dinner, and his son, Jimmy, couldn’t bear to eat it, so he stuffed it in his pocket. As a nanny, Maier tended to move often, but she remained with the Gensburgs more than 15 years, becoming a beloved family member — and staying in touch long after she departed. The Gensburg sons, now in their 50s, helped Maloof by opening a giant storage locker packed with Maier’s trunks, clothes, negatives, 8-mm films, audio tapes — and a birth certificate showing she’d been born in 1926 in New York (not in France, as the obituary said) to a French mother and Austrian father. Lane Gensburg’s voice softens when he recalls life with Vivian. “The best way I could describe her was she was like Mary Poppins,” says Gensburg, a lawyer who was just an infant when Maier arrived. “I think she could actually communicate with children much better than she did with adults,” he says. “She did amazing things with us, things out of the ordinary” — like staging plays for the neighborhood kids, taking them to a Chinese New Year’s parade, visiting a cemetery. But Maier made daily routines fun, too. She didn’t drive a car (she tooled around in a moped), so when they were late for school, she’d hitch a ride with their milkman, and off they’d go, three boys bouncing along in a clattering truck, their nanny hanging on the running board. Maier did splurge on movies — she liked to critique them and spot anachronisms — and books, racing through biographies and history volumes, faithfully reading The New York Times and National Geographic. She was a regular for 30 years at Bookman’s Alley, in Evanston, where owner Roger Carlson remembers her plucking out a limp $5 from her shoe to make a purchase or buying something and paying months later. Maier — a woman who never discussed her past or her family — wasn’t shy about interfering in the affairs of others. “She had a hell of a lot of advice for us,” Carlson says. She would tell him how to run his life; she would insist that his daughters should not get married. She could be prickly, too — refusing to take phone messages, berating cab drivers. Maier remained, above all, an observer. And not just with a camera. She recorded scores of interviews; stopping supermarket shoppers, for example, to solicit their views on Richard Nixon’s resignation. She had a video camera, too, and filmed everything from kids to the demolition of a Louis Sullivan building. She saved newspaper stories, too, neatly stored in plastic in dozens of binders — Ann Landers columns, pieces about French politics, obituaries and more. There was no explanation for why she collected them. Or why she never cashed thousands of dollars in income tax refund checks. Some questions, Maloof discovered, have no answers. 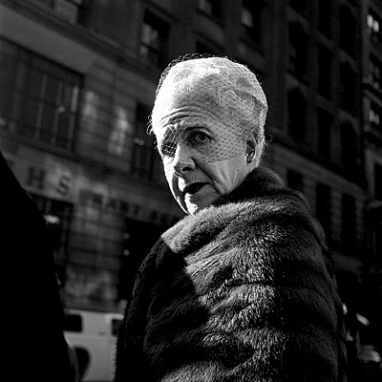 There’s no indication Vivian Maier ever studied photography. But a genealogist found an intriguing clue: a 1930 census showing Maier and her mother once lived with an acclaimed female portrait photographer, Jeanne Bertrand. Maier was just a child, but Maloof says that environment may have provided inspiration. Or a start. 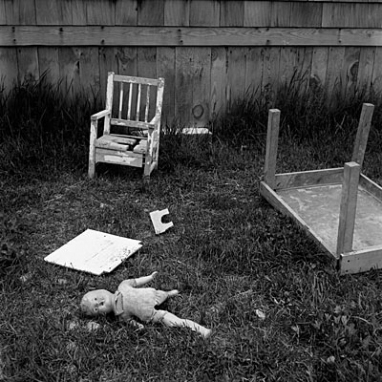 Maier’s photos range from 1949 to the mid-1990s. 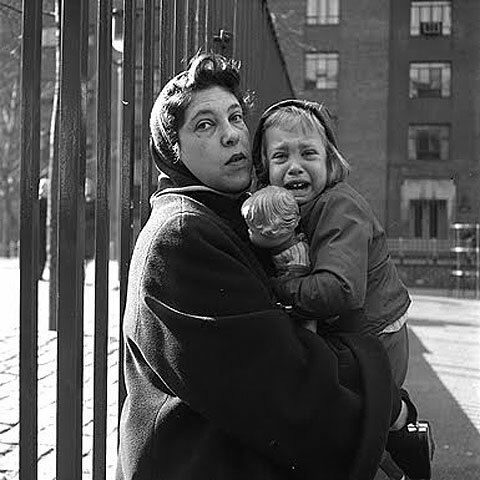 Mostly, her black-and-white images depict the poor, women (especially well-dressed dowagers) and children. After switching to color in the mid- to late ’70s, she turned to graffiti, as well as inanimate objects such as soda cans, headlines — and garbage. 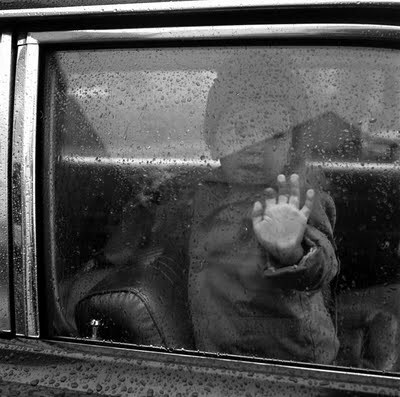 Maier also liked to shoot self-portraits, her solemn face seen through a window pane, a vending machine mirror or some other reflection. So what makes her work special? “She had an open and inclusive and very fundamental idea of what constituted ‘America’ that was missed by a lot of photographers in the 1950s and ’60s,” says Allan Sekula, the photographer who bought some of her negatives and teaches at the California Institute of the Arts. He points to one example — people blowing their noses in the middle of a Chicago snowstorm. Joel Meyerowitz, a prominent photographer and author, says he first thought Maier’s photos had been shot by a man. But she was tender, too. Meyerowitz sees poetry in her photo showing daisies popping up from the back seat of a convertible. And humor in another, featuring a man putting up a billboard of a reclining woman, and standing in a way that it looks like she’s giving him a giant kiss. “It’s hard not to love a lot of these pictures because of her sweet and innocent embrace of human beings,” he says. Maier made 3,000 to 4,000 prints. Maloof owns about 100,000 negatives and so far, has scanned just about 10 percent of them. (Another collector has about 12,000). About a third of Maier’s work remains in the rolls. No one knows why she left most of her work unfinished. Maloof thinks it was simply a matter of time and space. 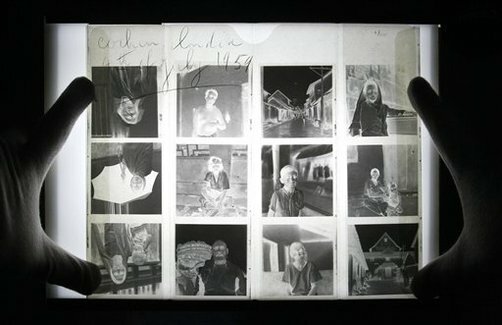 The only place she had a darkroom was at the Gensburg home. After she left, the rolls just piled up. Ideas and encouragement poured in. This winter, Maloof finally succeeded in getting a one-woman show for Maier at the Chicago Cultural Center — her U.S. debut. On a snowy opening night, Maier’s work was honored in the city that had been her photographic canvas; Maloof beamed as more than 1,000 people filed through the exhibit — including the Gensburgs. Maier’s photos already have been displayed in Denmark, Norway and Germany and in magazines in England, Poland and Italy, among others. He is not, he insists, looking to make money on her legacy — so far, his expenses have run to six figures, he says. 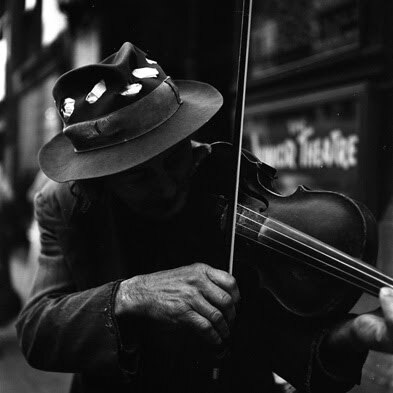 He merely wants to bring her photos to the world, and bring credit to an unsung artist. But what would the intensely private Maier think of all this? 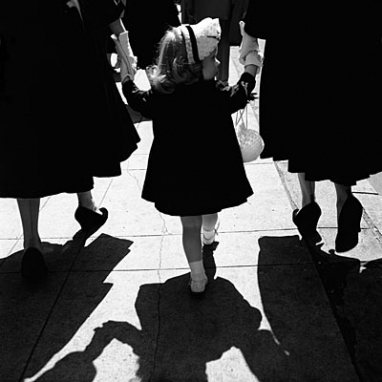 Vivian Maier remained an enigma until the end. She’d disappear for years, and then resurface. The Gensburg brothers helped rent her an apartment. They also gave her a cell phone, but she refused to use it. Maier wasn’t strong enough to return to her apartment, so they moved her to a nursing home. She was so unhappy, she pretty much stopped communicating — even with the Gensburgs. 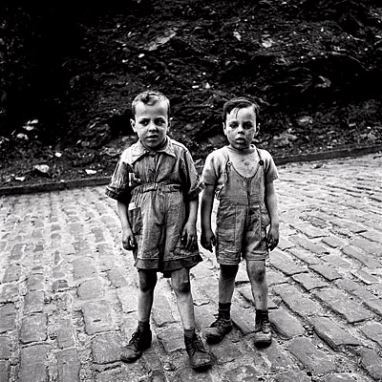 After Vivian Maier died in April 2009, the Gensburg boys — joined by their mother — returned to the North Shore woods where their adventurous nanny had taken them to pick strawberries. This time, they read psalms and scattered her ashes in the spring air.